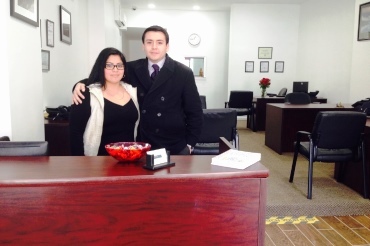 Five Star Financial Services opened its second location in May 2014, managed by Jonathan Rodriguez, who had been working with his father,Jose Rodriguez for five years at their location in Warren St. & Roosevelt Avenue on the second floor. Among the services they offer to the Jackson Heights & Elmhurst communities are tax preparation, insurance, accounting and filings of immigration forms; Jonathan also holds his real estate and mortgage license and is looking forward to prepare his team to get certified, in order to provide these services as well. This crew is convinced that providing confidence and respect to the clients will be their trademark. “Most people just want to be treated with respect, they want to be listened to, to be sat down and be explained why it works that way,” Jonathan stated. He knows that his mission is now to maintain the quality of service and recognition that he experienced while working with his father. Another challenge is to always be consistent on their service. As a new business leader, Jonathan makes efforts to keep a good environment in his office, by treating his staff well, and encouraging them to also make all customers feel comfortable. He recognizes warm and personal treatment as the best quality that a business can have. Proudly, he considers himself a people person. Five Star Financial Services counts on being well-known in the area and having their clientele grow in the near future. They are always happy to discuss each situation and give advice, in order to build trust with their clients and better serve their needs. Their purpose is to provide guidance for affordable prices by professionals in financial matters. Sometimes, they also play the role of advocates when, for example, they help someone to understand a document before they notarize it for them. The kindness of this young staff is definitely a great addition to our local business corridor. Five Star Financial Services abrió su segunda sede en mayo del 2014, administrado por Jonathan Rodriguez, quien ha venido trabajando con su padre, José Rodriguez por cinco años en la sede de la Calle Warren y la Avenida Roosevelt, en el segundo piso. Entre los servicios que ofrecen a las comunidades de Jackson Heights y Elmhurst están la preparación de impuestos, seguros, contabilidad y la aplicación de formularios de inmigración; Jonathan cuenta también con la licencia de bienes raíces e hipoteca y espera preparar a su equipo para certificarlo, y de esta manera incluirlo entre sus servicios. Este equipo está convencido de que el proveer confianza y respeto a sus clientes será su marca registrada. “La mayoría de las personas sólo esperan ser tratadas con respeto, quieren ser escuchadas, que se les invite a sentarse y se les explique por qué esto funciona de esta manera”, determinó Jonathan. Él tiene claro que su misión es ahora mantener la calidad del servicio y reconocimiento que experimentó trabajando con su padre. Otro desafío es ser consistentes en el servicio. Como nuevo líder de este negocio, Jonathan se esfuerza por mantener un ambiente agradable en su oficina, con un buen trato hacia su personal a quien también motiva a lograr que sus clientes se sientan cómodos. Reconoce que un trato cálido y personal es la mejor cualidad que un negocio puede tener. Orgullosamente, se considera una persona amigable. Five Star Financial espera ser reconocido en el área y hacer crecer su clientela en corto plazo. Están siempre complacidos de conversar cada situación y aconsejar a la gente, para así crear confianza y servir mejor a sus necesidades. El propósito de esta empresa es proveer acompañamiento a precios cómodos, por profesionales en asuntos financieros. Algunas veces, juegan también el papel de representantes cuando, por ejemplo, ayudan a alguien a entender un documento antes de notariarlo para ellos. La amabilidad de este equipo joven es, sin duda, una gran adición a nuestro corredor de pequeños negocios.